In deserts around the world, the presence of water, that rarest of desert commodities, allows life to flourish and provides an oasis for natural and human activity. 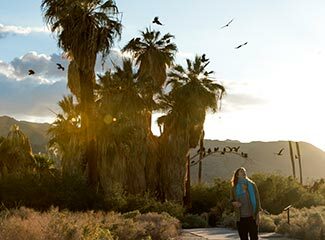 The historic Oasis of Mara in Twentynine Palms is a cornerstone of the Joshua Tree National Park story and has been a source of life-giving water for more than 9,000 years. Before the community of Twentynine Palms existed, a landmark line of Washingtonia filifera palm trees stood on the horizon near the oasis and signaled water and shade for the early Serrano Indians, and later Chemehuevi, followed by a small band of Cahuilla; then cattlemen and gold prospectors of the late 1800s; and the first desert travelers and homesteaders of the early 1900s. Col. Henry Washington, a desert land surveyor in 1855, reportedly counted 29 palm trees at the oasis, which became the city’s namesake. A year later, A.P. Green recorded palms and water springs, along with considerable signs of cultivation by the early Native American residents at the oasis. Today, a series of palm trees mark the line of original springs that once stretched from today’s Joshua Tree National Park Headquarters and Oasis Visitor Center along National Park Drive to the historic 29 Palms Inn, the site of the last remaining pond of water, and all the way to Adobe Road and the site of today’s 29 Palms Creative Center & Gallery. 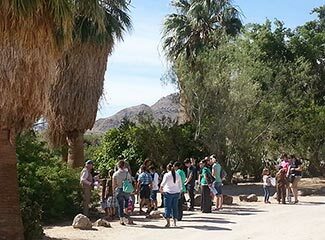 Contact the 29 Palms Inn at the Oasis of Mara (760) 367-3505 about Oasis Walks with naturalist Pat Flanagan on Saturday and Sunday mornings (pictured). Learn more about the Oasis of Mara on the Joshua Tree National Park website.